Updated Napili Studio:Great Ocean Views & Steps to beach:Snorkel,SUP,Golf,Hikes! Unit G 254 Check out June 2019 Special discount 7 nts or more! Napili Shores is an oceanfront two story complex of nine buildings perfectly situated on 6.3 acres of picturesque lush tropical grounds;Koi Pond and fountain off Lobby walkway. Located on the south end of Napili Bay, a protected, crescent-shaped, white-sand beach with breathtaking views of Moloka'i and Lana'i islands. Excellent for swimming and snorkeling; most likely sightings here include: sea turtles, colorful reef fish, dolphin pods and monk seals. In season, December-April, the Humpback whales are frequently seen with their young breaching in the waters off the bay! Great spot for families,honeymooners or anyone looking for a special spot to relax. We share our privately owned 'home away from home' with friends and referrals at reduced rates. 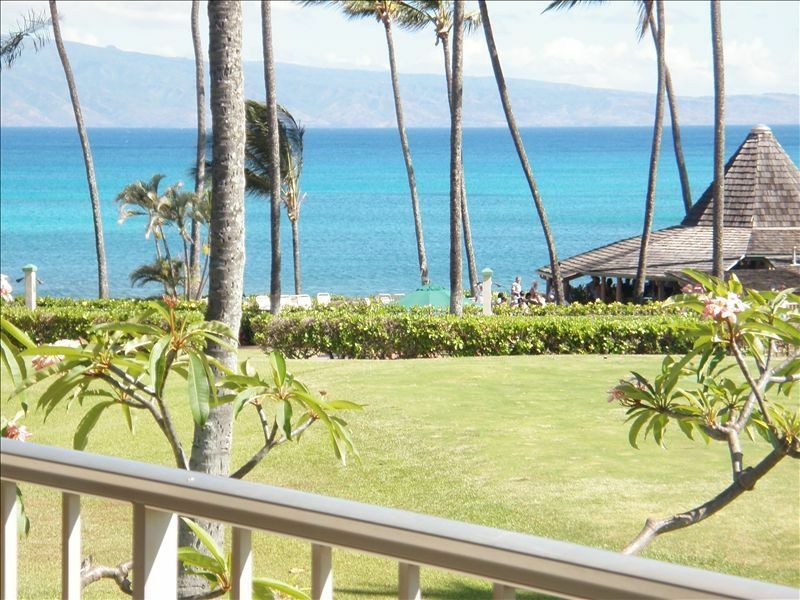 Enjoy the ocean and Moloka'i views from this second floor studio which captures the ocean breezes! Parking is free. The kitchen is fully equipped. There is a Queen murphy bed and sofa bed and ceiling fans and AC. For your convenience there is a lobby area with activities desk and restaurant open at 5pm, fully-equipped laundry room, two pools and jacuzzi, gas barbecues and picnic area with shuffleboard, giant checkers, and croquet. At the oceanfront pool area is the 'Gazebo' where breakfast and lunch are served and free coffee offered in the mornings. It is also a gathering spot to join with family and friends and watch the sunset. This is a popular location within walking distance to the famous Kapalua Bay and a short drive to Honolua Bay reserve renown for its underwater sea life, occasional spinner dolphin sightings and in the winter surfing on the point. Other activities close by include local golf,hikes, tennis, and Zip line at Kapalua. We find a relaxing atmosphere here at Napili Shores, we enjoy the beauty of the grounds and friendly service. A small bay with no high rise buildings, great bay to swim,snorkel or paddle and boogie board. In winter there is surfing and most exciting of all the whales breaching off shore! Protected bay for swimmers, no boats enter this bay. Occasional dolphin pods are spotted off shore. Reefs for snorkeling and usually lots of turtles; close by are hiking trails, golf and tennis. If you don't want to grill or cook, there are fine restaurants in the area including the famous Gazebo at the waters edge for breakfast or lunch on this property. Lahaina Town about 15 min south shops and restaurants open late on Front St.
Lovely view of ocean and Molokai from inside and lanai! For those days without trades there is portable AC. We have been staying at Napili Shores more than 12 years. Jay’s condo was perfect. Clean and comfortable. I love the door code instead of remembering a key card. Very nice studio suite, fantastic view, well appointed and newly renovated. What more could you ask! Had a great time, In a beautiful location and a beautiful unit. Brenda and Jay are great owners and make sure your accommodations are beautiful and well appointed. We love Napili Shores, one of the most beautiful locations on the island ! Mahalo David for your review. Glad that you enjoyed your stay at Napili and our recent updates for the unit. We welcome you to stay again on your next visit to Maui! This property has a lovely ocean view and is very close to the beach! It was nice to have access to two pools, one right next to the ocean, and one set back away from the ocean, and a hot tub. The property was nicely updated, clean, and comfortable. The bathroom is nice and big, and the vaulted ceilings made the living space feel much bigger. The lanai is wonderful for sitting and having morning coffee while looking out at the ocean. I would definitely stay in this property again! Mahalo for your review. Good to hear that you enjoyed the condo and updates. The view and location is special and provides for a restful stay. We welcome you back on your next trip! Glad that you enjoyed your stay at Napili Shores! The views and location is hard to beat! This unit will be going through and update next month so I invite you to stay on your next trip! explore tide pools and whale watching in season just off shore! Championship golf courses, tennis courts,Hiking trails with in walking distance @ Kapalua Bay.Kapalua Activities center,hiking trails and zip line. Large Shuffleboard/Chess on grounds Access to several beaches in walking or short drive away. Honokeana,Kapalua,Fleming beach walkable and Honolua Bay Reserve about 10min drive. JUNE 2019 SPECIAL: xmas holiday 10 nt minimum No Resort fee Outrigger does not manage this unit, please contact owner or cleaning service AC Code is sent for lock access after final payment Notebook in unit gives further details regarding unit/property info 5 nt minimum Ask about extended stay discounts Applicable Hawaii tax added.